It's Monday morning and you can't figure life out. What do you do? Stripes, girlfriend. You do stripes. Not that I needed another striped dress, but the vegan leather (okay, leatherette) pockets are a unique detail that made it worth adding to my collection. Oh, and the fact that it's only $15. Fiore Boutique was lovely enough to send this "Spotted Serena Shift Dress" on over, but for under $20 let's be real, I would've bought it anyway. I also have a handy coupon code, LULU10, to save you 10% off. How's that for a Monday morning pick-me-up? The "Spotted Serena Dress" is c/o Fiore Boutique. All opinions are my own and not influenced by the brand. you look gorgeous as always, love your coral lippies. I love this dress with the leather pockets! I need to scoop this up! and I love your arm candy! You look adorable! 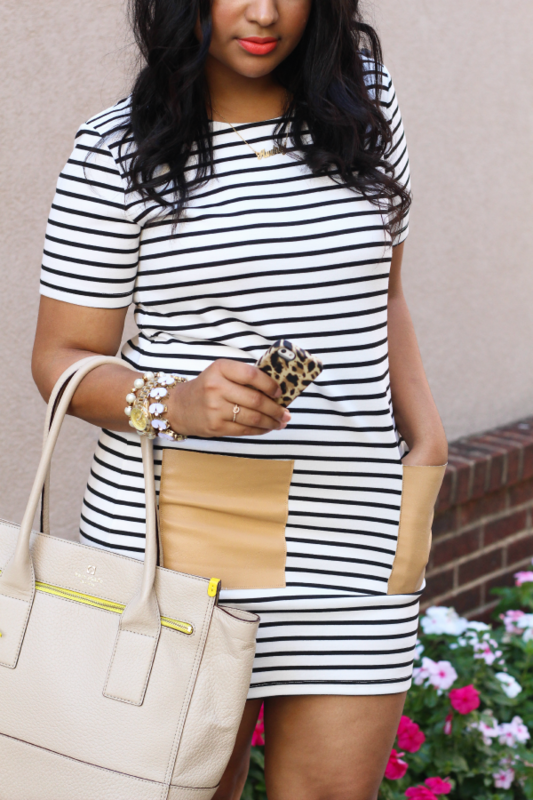 In love with the striped dress and the leather pocket detials is too cute! Have a great Monday girl! I can't believe this dress is only $15! 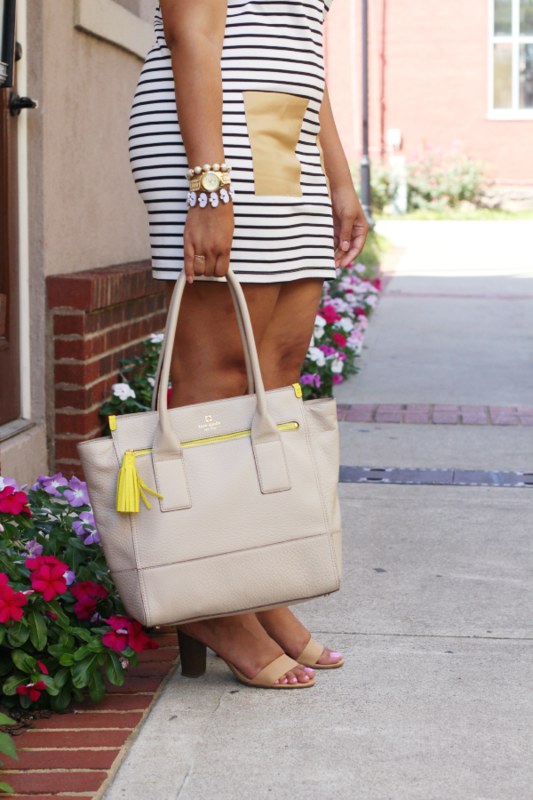 I love the faux leather pockets and you styled it perfectly with the neutral shoes and bag. Very pretty! Love this dress! SO cute! And obsessed with your Kate Spade bag!!! You look gorgeous in this girl!! 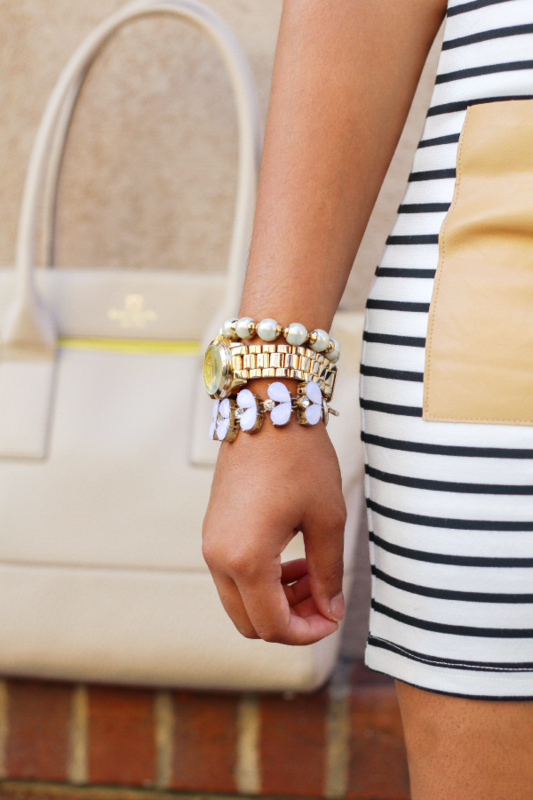 Your bracelets and shoes are the perfect accessories! Love this dress! And pretty sure I'm about to place an order! Love your striped dress!!!! the pockets add such a cute detail to the whole look! and for $15??? what a steal!!! 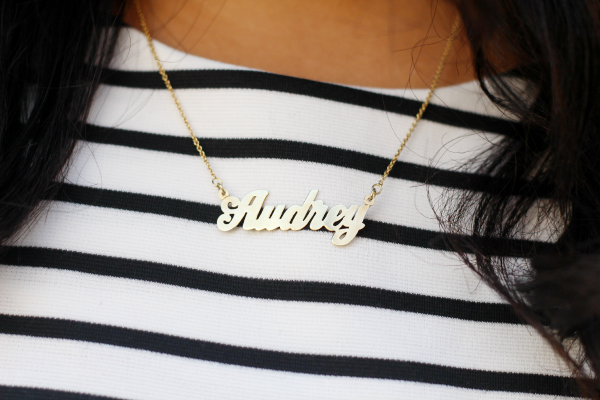 I also love your nekclace :) I want one too with my name, where did you get it from? if you don't mind me asking. I invite you to visit my blog and if you like it, let me know if you would like to follow each other to stay in touch. Love this tote! Where is it from? 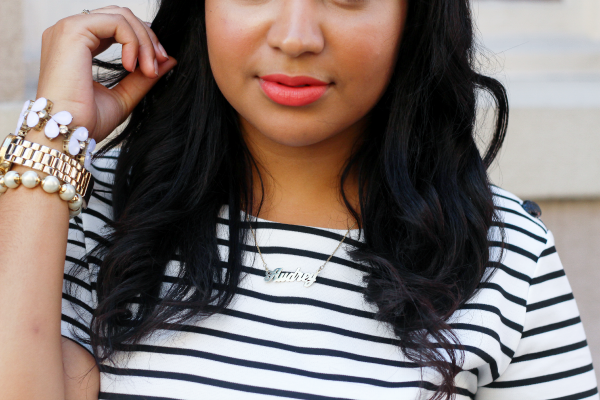 Stripes are such a classic go to, and I love your coral lips. Such a pretty color on you! wow you look so beautiful and stylish! Love these pics and amazing blog! So funny, I was literally looking at this dress this weekend! I love it and it looks great on you! Those bracelets are also so pretty! Wandered over here from a link -up and glad I did! I absolutely love this look from head to toe! The dress is so cute paired with the neutral shoes and bag. Stunning! Love, love, love this dress! The whole look is just simple and chic...gorgeous, Aubrey! This look is SO cute! I love love love!! LOVE this striped option!! 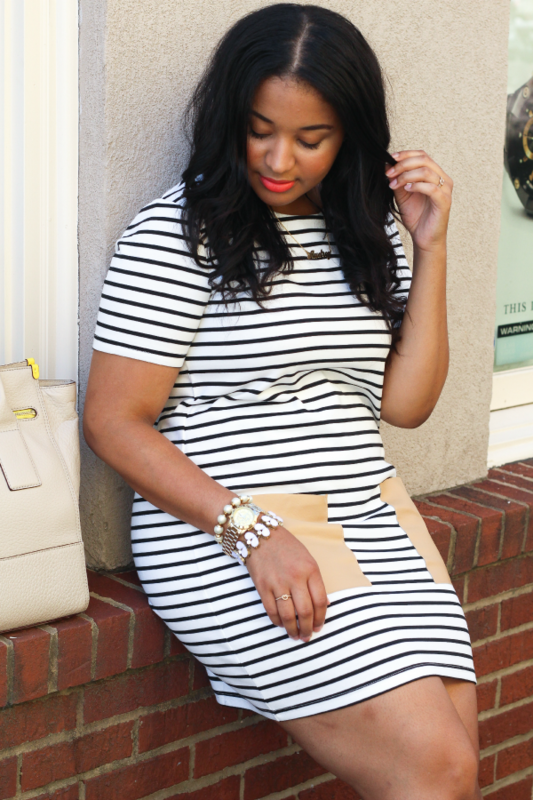 You are SERIOUSLY the queen of stripes!!!! Gorg Audrey! So adorable! That dress is so pretty! This is so cute sis! A very easy yet chic casual look.